Introduction and my BELOVED new maple kit! 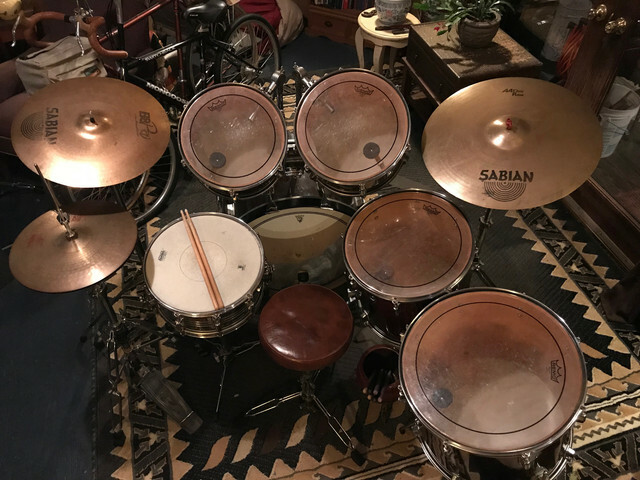 Re: Introduction and my BELOVED new maple kit! I believe I read that those are Keller shells. Beautiful drums. As Austin has stated, his are a year or two before Pearl used Keller shells. Here is my thread for the US Maple Pearl's that I found last November. You can see that the badge states "US Maple". There are some other differences. I believe Austin's toms will have mufflers for the batter heads, the US Maples do not have these. The US Maples also do not have the "Maple Shell" badge, have two badges on the mounted toms, and all have dual breathers. His Jupiter snare though is really sweet, so he doesn't need to be too jealous!! Last edited by sksmith2500; 07-03-2018 at 12:54 PM. Haha! You're correct on the internal mufflers. There is a batter side muffler for the snare, and all 4 toms. The ones for the toms were missing when I bought the kit, but luckily Pearl still makes them, so I went ahead and replaced them. I'd much rather see some nice chrome muffler knobs than a couple of random holes in each shell. Although I do absolutely love the Jupiter snare, I am still jealous of your 8x14 snare though! I want one!!! And yes each of my shells have a "Pearl" badge, a separate "Maple Shell" badge, and 1 air vent. You can see the mufflers in this pic. I think the originals ones would have been white felt, but the replacements are grey. As I've said before, I'd like to add a few more cymbals and stands to this kit. Originally it would have come with two 903D straight stands. One of which was still with the kit when I found it, and I really like it! I also like things to match, and I like heavy duty stands, so I decided I'd try to find another 903D straight stand or two, and maybe a couple of boom stands from the same series as well. 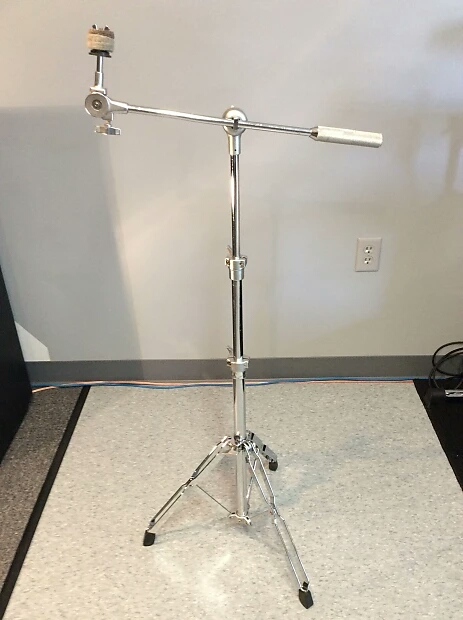 Haven't come across any of the straight stands yet, but I did snag this 903BST boom stand off of Reverb the other day. I haven't received it yet, but it looks to be in great shape! I know it's going to weigh a ton lol. My 903D probably weighs 10 or 15 lbs. No ultra lightweight hardware here! I think it will be really cool to have all of the period correct matching hardware for this kit. I dig the sandblast finished bits on them. Matches my tom arms and memory locks! Nice kit Austin. The rest of the band is going to have no trouble hearing you! Looks like thunder down under is coming their way. This is a great find! As others have mentioned, that snare drum alone is a big score. I have a Pearl MLX maple kit from the early 1980s, black lacquer inside and out. Those maple shells really sing and have great projection, and that walnut finish on your kit is classic and gorgeous. Your excitement is like rocket fuel as well brother - congrats and enjoy them! Thanks guys!!! They definitely have no problem getting loud, but they're also sensitive enough to play quietly, and everything in between too! It seems a lot of people tend to overlook these not realizing that they're high end, and exactly the same as the early "M Series". They just changed the name from "G Series" in 1982. Regardless of what anyone else thinks though, I wouldn't trade this kit for anything! So nice to see your joy, mate! I'm happy for ya! Play them, enjoy them, best of luck with the band! Congratulations on getting your dream kit! It’s great to see a great kit fall into deserving hands. So many amazing ones get priced out of players hands, and end up unnplayed on a collectors shelf somewhere. In the 80’s Pearl hardware pretty much was the standard. Everyone was using it for cymbals. Thanks guys! I've been playing them like crazy! I'm still just as excited about them as the day I got them too! The fact that the new kit feeling hasn't worn off really tells me that this is the perfect kit for me. I honestly can't think of a single complaint I have about them. I've been using my new boom stand lately as well, and it's great! Weighs in at a little over 11 lbs. but that's okay by me. I really dig how solid everything is! I feel like I've found my instrumental soul mate lol!!! Interestingly the combination of clear Pinstripe batters over coated Ambassador resonant heads on the toms sounds really, really good!!! They have the attack from the clear batters, but yet also that fat, round warmth from the coated resos. Kind of the best of both worlds! I think I'm going to leave them that way for a while. Anyone else ever play clear over coated like that?